It was home care Friday again. As usual this big baby was crying, with genuine big pearly tears, when she realize that this clinic is for her when we pushed her into the familiar waiting area. Weight is at 11kg+++ while her height is at 88cm. According to the charts, physical growth is within healthy range. The 1st person to work with K is important. They have the ability to make it into a cheerful session or a fussy session. We had the speech therapist first up. There was promise of food into her mouth. Yummy. The offer of food was good enough for her to open up and welcome the therapist with smiles. We spent more time with the speech therapist as we worked together to see if there are ways to help her with speech. For that, we put her in the tumble form feeder chair. It was at a pretty high inclination for K. It got me worried abit as K spends most of her time lying down flat or not almost flat. But hey we are in the hospital already right? We were glad that she was able to handle it. Her spo2 maintained at a very good level and managed her secretions well ( she spits it out instead of swallowing). Maybe the motivation of food is strong enough to make her work hard. With the food, we make her work her tongue to stretch and taste the food dipped on the chewie stick. We learnt some massage to help her with some passive movements around her lips area. What we conclude at end of session was that she still had some limited movement in her tongue and lips, but we have to get her to put 2 and 2 together, There are definitely lots of work to be done in this area. 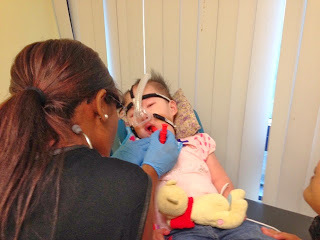 We are also at a time where the nurses and doctors feel that we can change K’s button. We are using the Bard. Her valve is probably stuck and back flow happens when we unplug her feeding tube. Will be considering the MicKey or the AMT, preferably one that can allow feeding of purée as well. 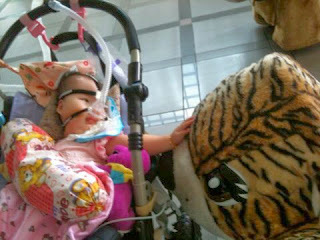 This is K having her fun time after her rounds with the doctors and nurses, looking at the one of the kids ride KKH.